This is a first for us in all of EFF's history of Freedom of Information Act (FOIA) litigation—Immigrations and Customs Enforcement (ICE) has demanded we return records it gave us more than a year ago. The release of these documents doesn't endanger national security or create a risk to an ongoing law enforcement investigation. Instead, it seems that ICE simply wants to stymie further FOIA requests from EFF as we try to get answers about the government's electronic surveillance procedures. It started a year ago when ICE produced records in response to one of our Freedom of Information Act lawsuits. The records show that companies like Comcast, Cricket Communications, Metro PCS, Southern Linc Wireless, and T-Mobile either pushed back on or failed to comply with specific requests for information on their customers. For example, in response to one of ICE’s pen register/trap and trace orders, Southern Linc said it “did not like the wording of [the] order” and “would not give ‘real time’ ping location for [the] phone, [it] would only give 1 hour old history.” ICE also reported that it experienced “technical issues . 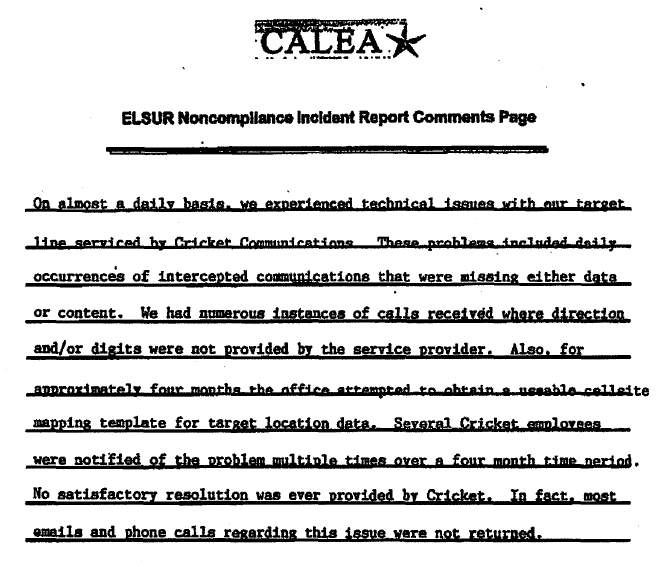 . . on almost a daily basis” trying to get data on a suspect from Cricket Communications.” And Comcast gave ICE the runaround for a month before it turned over IP log history. These records are the first we’ve received in response to our FOIA litigation that actually provide some of the information we asked for—specific examples of problems federal agents have faced getting companies to comply with communications surveillance orders. We filed this request two years ago after the New York Times reported that the FBI and other agencies were pushing Congress to expand the Communications Assistance for Law Enforcement Act (CALEA) to require companies like Blackberry, Skype and Google to build back doors into their systems. And ICE should be commended for releasing these records with only minimal redactions. However, ICE should not be commended for what happened next. Based on the important information revealed in this limited set of records, we asked ICE to give us copies of all other records that looked like these. It didn’t seem like a tough request to fill, given that these seem to be standardized reports—and that we included a copy of the records so that ICE would know what to look for. But ICE refused. First the agency argued EFF’s request was too broad—that it couldn’t possibly search through all its individual offices to find these forms (despite the fact that ICE officers seemed to be encouraged to send the forms to a central fax number). So, to lessen the burden on the agency, we narrowed our FOIA request to cover only a handful of specific ICE offices that reported having problems. It took ICE almost a year to get back to us on the narrowed request, and when it did, its response was frustrating. Not only did the agency decide that it would still be too burdensome to conduct any kind of a search for similar records, but ICE also told us it never should have turned over the original records in the first place—and it wanted them back. The problem for ICE is, these records have already been in the public’s hands for over six months—we filed them as an exhibit (pdf) in our FOIA litigation (pdf) in March 2012, and they’re readily available on the PACER docket for the case (or from the Internet Archive). This is yet another example of the federal government failing to comply with the letter and spirit of the Freedom of Information Act—reverting to secrecy when it should be promoting transparency. It’s hard to imagine what harm could come from the release of these documents. ICE was careful to block out any information in the records that would identify the target of the investigation, and the information that isn't blocked out seems to reinforce the government's position on CALEA. And it’s another disappointment from an administration that lauded its commitment to transparency on the first day the President took office four years ago. We can only hope that if the President wins this tight election, he’ll use the next four years to fulfill this commitment. Read ICE's reports here and the agency's letters to EFF here, here, and here.